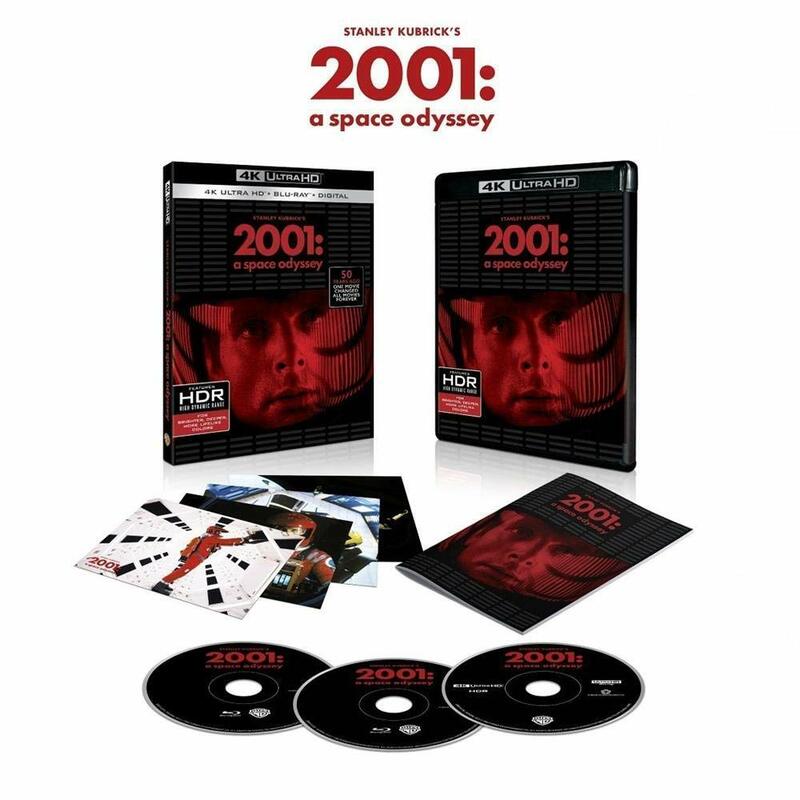 Stanley Kubrick’s ‘2001 A Space Odyssey’ 4K UHD Blu-ray Review! I’m going to stand out here and yell it. I believe Stanley Kubrick’s 1968 film ‘2001 A Space Odyssey‘ is one of the greatest if not THE GREATEST movie of all time. I mean it doesn’t hold a candle to ‘Army of Darkness‘, because that’s in its own category of greatness, but for all other films, ‘2001 A Space Odyssey‘ is right at the top of the list. Kubrick was known for making movies in different genres, time periods, and subject matters. He never did the same thing twice. With ‘2001‘, he went to the past and jumped right into the future with perhaps the biggest time jump out of any piece of cinema. The “Dawn of Man: segment showcases apes learning to live, but when the famous black monolith comes into play, it push life forward and the apes begin to use tools and weapons, which then transitions us into space and people living and working in outer space, which brings us to the meat of the film – Artificial Intelligence, which is scary as hell. The last segment deals with the Star Child and the circle of life going forward as the monolith pushes for change. This is a very visual film complete with some of the best visual effects still to this date set in outer space. It ever won and Oscar back in 1968. There are so many different themes and interpretations to this movie that I could be here for hours explaining all of them, but I think Kubrick wanted to show how life can progress and the chaos and beauty that comes with it. It’s simply phenomenal with each viewing. Luckily for us, Warner Bros. has started releasing Kubrick movies in 4K UHD, this being the first one with filmmaker Christopher Nolan supervising the new 4K transfer. I hope there is a big set soon. Stanley Kubrick’s dazzling, Academy Award®-winning achievement is a compelling drama of man vs. machine, a stunning meld of music and motion. Kubrick (who co-wrote the screenplay with Arthur C. Clarke) first visits our prehistoric ape-ancestry past, then leaps millennia (via one of the most mind-blowing jump cuts ever) into colonized space, and ultimately whisks astronaut Bowman (Keir Dullea) into uncharted space, perhaps even into immortality. “Open the pod bay doors, HAL.” Let an awesome journey unlike any other begin. Please listen to the review in podcast form below. And don’t forget to visit iTunes and Stitcher to subscribe to our podcast. Enjoy the show and see you next week! Thank you for listening. ‘Willard’ (2003) – My Bloody Podcast #41! ’10 to Midnight’ – Blu-ray Review! WWE Fastlane 2019 – Wrestling is Everything Podcast #24! This entry was posted on Wednesday, December 12th, 2018 at 5:15 pm	and is filed under Film, News, Podcast. You can follow any responses to this entry through the RSS 2.0 feed. You can skip to the end and leave a response. Pinging is currently not allowed. « Lucio Fulci’s ‘ZOMBI’ Blu-ray Review! You have his heart, now I'm going to break it.